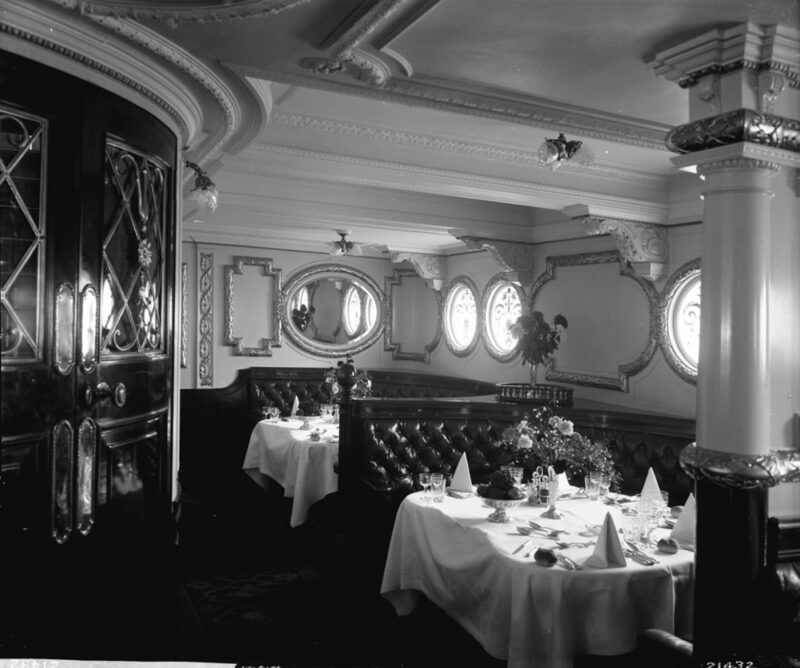 Home / CRUISING THE PAST / RMS EMPRESS OF IRELAND – THE FORGOTTEN “TITANIC”! In this horrific maritime disaster, over a thousand passengers en route from Quebec to Liverpool were lost in just fifteen minutes—the length of time it took for the ocean liner to sink into Canada’s Saint Lawrence River after being hit by a ship called The Storstad. Canada was a growing nation of only eight million at the time, making the loss of over a thousand people in the accident a national tragedy. 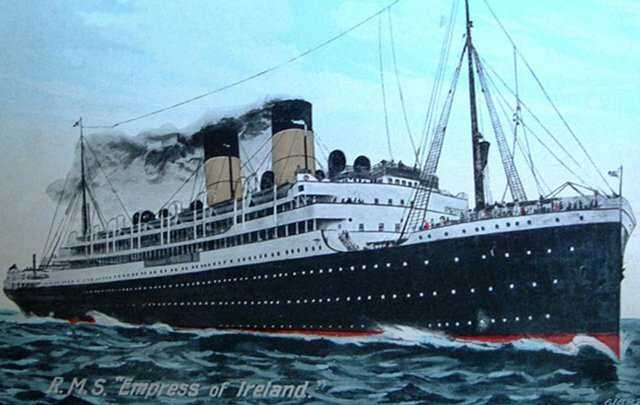 The Empress of Ireland, sister ship of The Empress of Britain, played a massive role in Canada’s flourishing population and economy in the early 1900s. She carried tens of thousands of passengers between Canada and Great Britain over a few short years, and brought 100,000 newcomers to live in Canada. A licensed Royal Mail Ship (RMS), she transported a huge volume of mail between Canada and Great Britain as well. 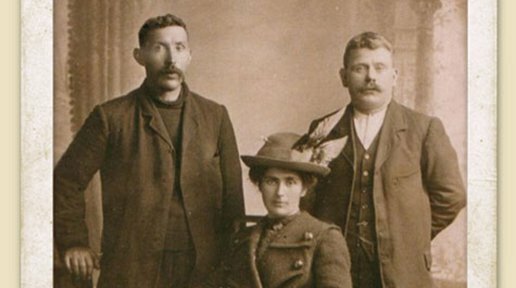 The Canadian Museum of History unveiled a powerful, inclusive, detailed exhibition titled “Canada’s Titanic – The Empress of Ireland” for the 100th anniversary on May 29, 2014, which ran through April 6, 2015. It featured more than 500 recovered items from the wreckage, compiled by collector and diver Philippe Beaudry: documents and artifacts such as dishware and furniture from the ship’s separate classes, photographs, personal papers, the ship’s bell and porthole and an eight-year-old survivor’s memoir. Shaw TV’s Paul Beilstein visits shipwreck historian, Chris Klausen to relive the story of the Empress of Ireland, Canada’s own tragic Titanic story. At 1:38 a.m. on May 29, 1914, the lookout on the crow’s nest of The Empress of Ireland spotted the mast of the headlight of The Storstad, which had been carrying 10,000 tons of coal. The two vessels continued to steam toward one another, and just nine minutes later at 1:47 the fog became too thick, hiding the ships from one another. There was a misunderstanding between the two captains about their respective boats’ positioning and direction, leading to the fatal collision. The Storstad hit The Empress of Ireland broadside, tearing a 350 square foot hole in her hull. With water pouring in at 60 gallons per second, the ship sank rapidly. 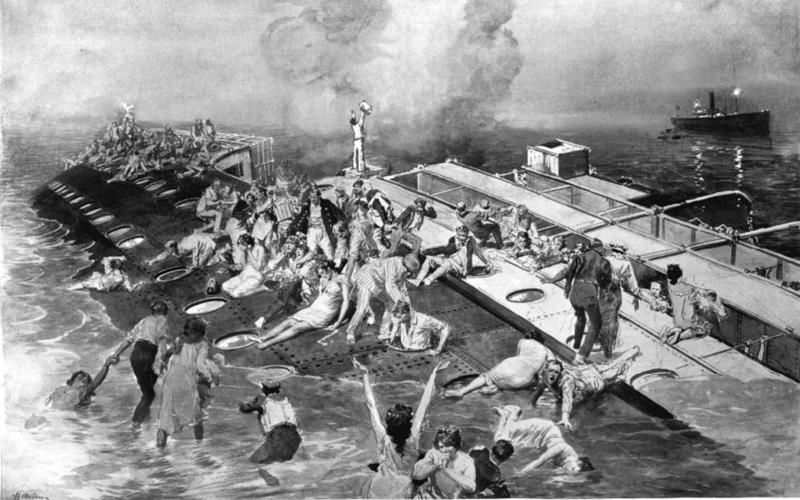 Hundreds of sleeping passengers were trapped, and the second and third class passengers had much less of a chance at survival than the first class passengers, as first class was higher up on the boat. Out of 1,477 passengers, only 465 survived. And out of 138 children that were on board, only four survived. Crewmembers of The Storstad (which was left unharmed) along with two other rescue ships from the nearby city of Rimouski came to pick up the survivors. The survivors were then taken to Rimouski where they were taken care of. 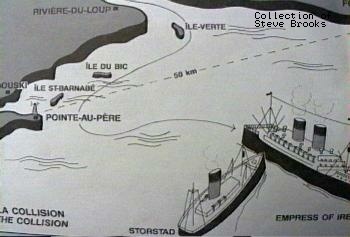 As for The Storstad, it continued on its journey to Montreal with just a broken bow. Among the passengers were many Irish. Grace Hanagan, of Irish descent, was the youngest and last survivor of the tragedy. She passed away in 1995 but spent the rest of her life spreading her story and keeping in contact with other survivors. One Irish passenger, William Clarke of Co. Louth was especially lucky. He served as a fireman on the crew of both the Titanic and The Empress of Ireland, managing somehow to survive both. Irish immigrants who perished in the tragedy. There were plenty of people of close Irish descent sprinkled about the first, second and third class cabins. The list of crewmembers (stewards, seamen, firemen, trimmers and other workers of the like) is made up of almost all Irish surnames. Among the 87 passengers in first class was well-known actor Laurence Irving, who drowned when he dove back into the river to find his wife Mabel after already having found safety. Neither of their bodies was found. 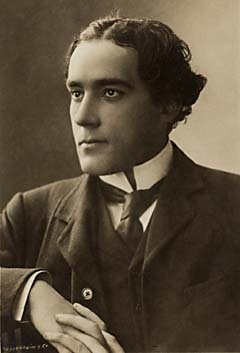 Famous actor Laurence Irving helped save lives but perished. There were 170 members of the Salvation Army in second class, as well as an orchestra of around 40 musicians who were on their way to a convention in London. Much of third class was made up of laid-off Detroit Ford workers returning home to Europe, along with many attempted immigrants who weren’t able to make it through. Today The Empress of Ireland is accessible to divers, at only 130 feet below the surface. It has been visited by those experienced enough to dive in such cold temperatures hundreds of times since the ship’s rediscovery in the mid-1980s. However, it’s been buoyed off as “historical and archaeological property,” and divers must follow a strict set of rules to ensure they don’t damage the site. Only a couple of weeks after the disaster, Canadian Pacific hired a salvage company to dive down, blast a highway into the heart of the ship and fetch the mail from the first class cabin. They also retrieved what would be two million dollars today. The ship sank in 14 minutes. Divers have encountered all sorts of decaying debris like shattered suitcases, china, chairs and tables, light fixtures and the like—Philippe Beaudry was dedicated enough to create an extensive collection of his findings with over 500 objects, and he also contacted and traded with other divers in order to further build it. One diver entered the mailroom and discovered a box of neatly bundled and tied newspapers with paper still white and print still readable, dated May 27, 1914, but when he returned for it, the silt at the bottom of the river had shifted and buried the papers. Unfortunately divers have taken most of the human bones as well. On the 103rd anniversary of The Empress of Ireland tragedy and beyond, it’s important that we honor and remember the 1,012 unsuspecting children, women and men with all sorts of histories who lost their lives in a matter of minutes.